Most every photographer loves to have people compliment them on their pictures. But, let’s face it, not every picture is compliment worthy. The world is full of way too many boring photos. Cyrill Harnischmacher is out to change that in his newest book The Wild Side Of Photography. This is not your normal “hold-the-camera-steady” or “use-a-shutter-speed-equal-to-your-lenses-focal-length” type of photo book. 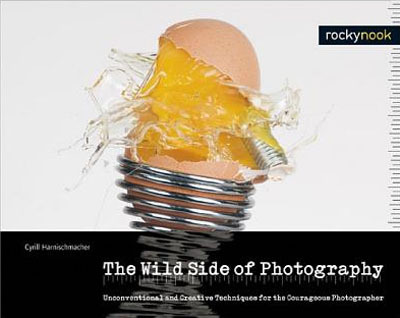 As a matter of fact, the book is subtitled: Unconventional and Creative Techniques for the Courageous Photographer. Harnischmacher has gathered a dozen+ photographers with the most diverse list of specialties to assemble this book. There are creative suggestions to suit just about any experience level when it comes to your talent or equipment in the photo field. Starting with blurring photos, both during and post exposure, Alain Briot explain how he creates his art prints. He not only explains the handheld technique used to shoot, but also gives exact Photoshop and Lightroom settings he used to achieve his results. Gerhard Rossback shows how a miniature product shoot can be easily set up using a laptop and a couple inexpensive USB lights. You’ll learn how to turn your telephoto lenses in telescopes, paint with light – graffiti style, and handle shooting the moon & stars with ease. Two unique ways of dealing with aerial photography – sans plane – are explained using oversized monopods and kite supported cameras. Detailed instructions and sources are included for your material needs. This book is 21 chapters of creativity. With this guide in hand, there’s no more excuse for shooting boring photos.